Approved Training through PATH Intl. There are two ways to study the basics for achieving PATH Int’l Registered Certification to become an instructor. Both require successful demonstration of skills and knowledge outlined in the Registered Instructor Criteria: certification can be achieved through attending a PATH Intl. Approved Instructor Training Course (offered here at High Hopes) or through a Phase 1 & 2 multi-step, self-directed educational process which culminates in an On-site Workshop and Certification. This section describes the Instructor Training Course (ITC). The On-site Workshop and Certification is described in the OSWC section of this website. Riding instruction and volunteer experience in a therapeutic riding program are strongly encouraged. Riding instruction and volunteer experience in a therapeutic riding program are strongly encouraged. The course is taught in two parts, and incorporates lecture, practicum, teaching and testing components. Students receive experience in teaching one-on-one and group lessons. Our course faculty includes more than 10 experienced teachers with backgrounds in physical therapy, occupational therapy, speech and language pathology, master and advanced level instructing, expressive therapies, recreational therapy, nonprofit management and fund development. 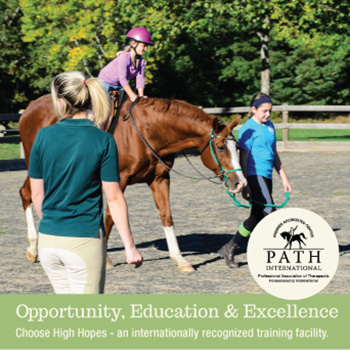 The diversity of our program participants and therapy horses, combined with our skilled volunteers, provides a learning environment where student instructor trainees can advance their knowledge and skills, learning how to plan and implement safe, effective therapeutic riding lessons. Submission of a riding video performing the published riding pattern is required as part of the application process. Riding skills at the strong intermediate level must be demonstrated for acceptance into the course. Skills must demonstrate ability to perform walk, trot, canter, knowledge of correct leads and diagonals, security of seat, appropriate contact and communication with the horse, accurate demonstration of correct bend and performance of ring figures throughout the pattern. Proof of previous volunteer experience of at least one year at a therapeutic riding program strongly encouraged. Experience teaching non-therapy riding strongly encouraged. 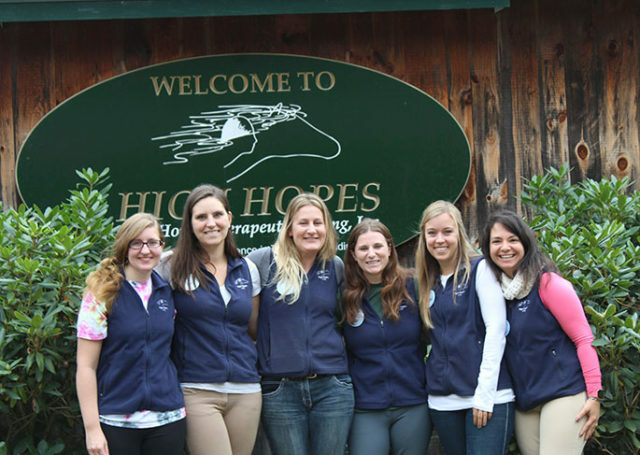 High Hopes offers lectures and workshops on topics related to equine assisted activities and therapies including disabilities, equine care, effective instruction and non-profit administration. Learn more. Our one and a half day workshops are designed to provide PATH Intl. Certified Instructors with an overview of the role of a mentor within the EAAT industry and the necessary skills and tools to apply this knowledge to mentor other instructional candidates. All volunteers must attend a General Orientation prior to volunteering. Training sessions are offered throughout the winter, spring, and summer! Looking to keep moving forward in your training? Find out more.